Atmospheric models simulate many processes and feedbacks among them. 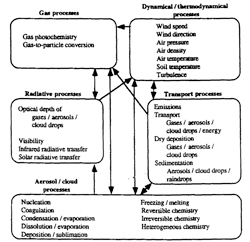 Figure 7.4.2-1 shows a diagram of a model that simulates gas, radiative, aerosol, dynamical, transport, and cloud processes. Gases are distinguished from aerosols in two ways. First, gases consist of individual atoms or molecules, whereas aerosols consist of aggregates of atoms and/or molecules, bonded together. Thus, aerosols are larger than gases. Second, whereas aerosols are liquids or solids suspended in the air, gases are in their own phase state. Aerosols can contain many components, including liquid water. Cloud drops are aerosols on which significant water vapor has condensed or deposited and are larger than most, but not all, aerosols. Raindrops are cloud drops that have aggregated together or grown in size Gas molecules have diameters on the order of 5 x 10-10m, aerosols have diameters that range in size from a few tens of gas molecules to 10 mm, cloud drops have diameters between 10 and 200 μm, and raindrops have diameters between 200 μm and 8 mm. In this text, a particle is defined as an aerosol, cloud drop, or raindrop. An important process that affects gases is chemistry. Gas Kinetic chemistry is the process by which reactant gases collide with each other and transform to product gases. Photolysis is the process by which reactant gases are broken down by sunlight to form products. Photochemistry is defined here to encompass kinetic chemistry and photolysis. 7.4.2-1 Diagram of processes simulated in an atmospheric air-pollution model and the interactions among them. Adapted from Jacobson et al. 1996; Jacobson 1997 a, b.
Gases are also affected by gas-to-particle conversion. Conversion processes include nucleation, condensation/evaporation, dissolution/evaporation, deposition/sublimation, and heterogeneous chemistry. Nucleation occurs when gas molecules aggregate and condense in a cluster until it reaches a critical size, at which point it is a small particle. Condensation occurs when a gas diffuses to and sticks to the surface of a particle and changes state to a liquid. Evaporation occurs when a liquid molecule on the surface of a particle changes state to the gas phase and diffuses away from the surface. Dissolution occurs when a gas molecule diffuses to and dissolves into liquid on the surface of a particle. Evaporation, in this case, is the opposite of dissolution. Gas deposition is the process by which a gas diffuses to and sticks to the surface of a particle and changes state to a solid. Sublimation occurs when a solid molecule on the surface of a particle changes state to the gas phase and diffuses away from the surface. Gases react chemically on the surfaces of particles during heterogeneous chemistry. Gas concentrations are also affected by emissions, transport, and dry deposition. Emissions usually originate from near or above the ground. Transport may be horizontal or vertical. Dry deposition (different from gas deposition) occurs when gases (or particles) impinge upon and stick to a surface. Gases impinge upon a surface when the wind or eddies carry them to the surface. Molecular diffusion, which is the movement, collision, and random redirection of molecules, also transports gases to the surface. 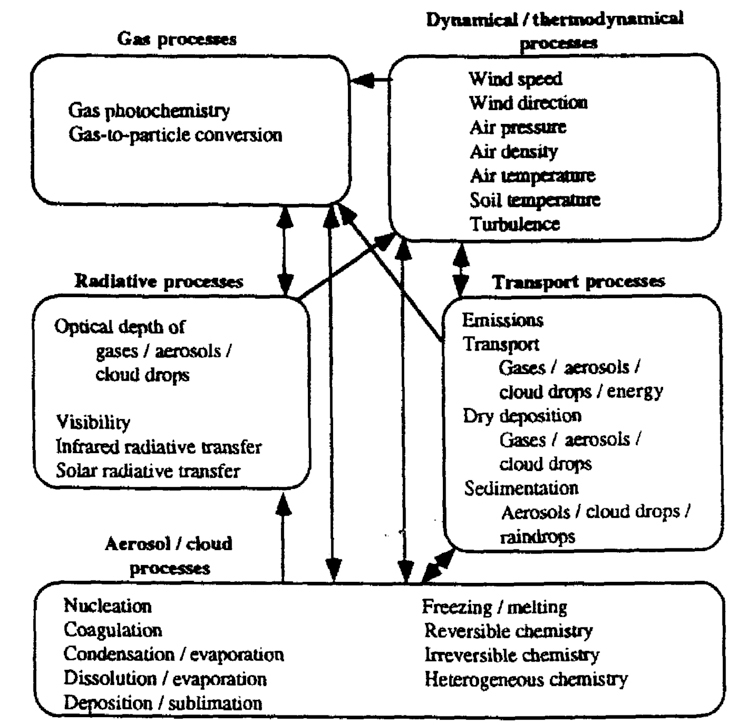 Gases influence meteorology through radiative transfer. Gases absorb and scatter solar radiation (emitted by the sun) and infrared radiation (emitted by the earth, atmosphere, and the sum). Changes in absorption and scattering affect temperatures, which affect pressures. Pressures affect wind speeds and directions. Aerosol and cloud processes include gas-to-particle conversion, coagulation, freezing/melting, equilibrium chemistry, and aqueous chemistry. Coagulation occurs when two particles collide and stick together to form a third, larger particle. During freezing, liquid within a particle changes state to a solid. Melting is the reverse. Equilibrium reactions are reversible chemical reactions that occur between or among liquids, ions, and/or solids within particles. Aqueous reactions are irreversible reactions that usually occur among species dissolved in water. Aerosol and cloud drops are also affected by emissions, transport, dry deposition, and sedimentation. Sedimentation is the process by which particles fall from one altitude to another or to the surface due to their weight. This differs from dry deposition, which occurs when particles diffuse to, blow over, or fall on a surface and stick to the surface. Aerosols and cloud drops scatter and absorb solar and infrared radiation. Gases, aerosols, and cloud drops all affect visibility, but aerosols (and clouds) affect visibility more than do gases. The primary meteorological variables in an atmospheric model are wind speed, wind direction, air temperature, air density, air pressure, and water content. These variables are simulated by solving a set of partial differential equations and parameterized equations, including the momentum equation, the thermodynamic energy equation for total water. The primary radiative variables in a model are heating rates and actinic fluxes. The former are used to calculate changes in temperature, and the latter are used to calculate photolysis rate coefficients. Both variables are calculated with the radiative transfer equation. Pollutant parameters in a model are gas and aerosol concentrations. Changes in concentration are found by solving ordinary differential equations that describe chemistry and physics and partial differential equations that describe transport. In sum, weather, climate, and air pollution can be modeled by taking into account a fairly well-defined set of physical, chemical, and/or dynamical equations. with consideration of the key progress necessary to include feedback processes between meteorology and chemistry, aerosol formation in cloud development with subsequent effects on wet removal, dry deposition and surface exchange processes, and impacts of chemical perturbations on radiation, climate, and weather, these improvements would result in a comprehensive system, the "third-generation model" take the example of Models-3.